Gamification has emerged as the latest fast-track solution to acquire, engage and retain users for any new mobile or Web application. The basic idea is that if you understand what motivates your users you can design an experience that selflessly guides the users towards your endgame - whatever that might be. Foursquare made gamification famous beyond the gaming community and start-up digerati when it introduced badges, mayorships and leaderboards to drive users to add locations and check-in. Amazing how little it takes for us drones to do things for free and tell people about it. Abraham Maslow figured this out all the way back in the 1950s, that the ultimate human need - once physiological, safety and self-esteem are all satisfied - was about self-actualization to reach our full human potential. It may sound silly, but early adopters are only early adopters if they live to tell the story. That’s the secret behind extrinsic motivation in a nutshell. Beyond that, we are looking at why people keep playing. In Foursquare’s case, you are bound to get bored once you have achieved mayorships in all of your neighborhoods coolest hangouts and collected the most eccentric badges. It happens in games, in sports and in life. Been there, done that. Whatever. There has to be something more. And, there is. Intrinsic motivation is what psychologists calls the drive we have when we engage in activities for the enjoyment of the activity in itself. For some people that is reading a good book, and/or cooking a good dinner. For others, it's running a marathon. In the short run, we appreciate the small rewards along the way. In the long run, however, we do what we do because we have to. It’s who we are. 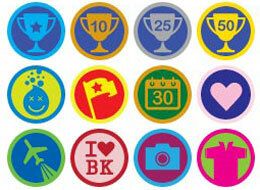 In Foursquare's case, this meant to design a service that extended beyond the smaller rewards. In my mind they have succeeded as the rationale behind my usage today compared to my early adopter days is no longer only about achieving digital knighthood and being elevated to the upper echelons of the geekdom. Today, I like the opportunity of serendipitously running into friends and foes while traveling across the world as well as having my location history easily accessible. It has also become a fantastic utility when traveling, accessing the latest and greatest information of which drink to choose in that trendy London bar or the password to an elusive WiFi network. BJ Fogg at Stanford’s Persuasion Lab has figured out that to really encourage a certain behavior you need to combine motivation with ability and create triggers. This is an amazing leap forward in a world that is rapidly shifting, from overall paradigm to value, behavior and market shifts. Understanding human behaviour has become the latest academic wunderkind within social sciences and psychology. There is just so much you can fill the broadcasting pipe with before it bursts. The industry has understood that the smartest way to anyone’s heart is to understand what makes them tick-tock. Mihály Csíkszentmihályi, another legendary and groundbreaking psychologist, pushed Maslow’s self-actualization even further, discovering that self-actualized people reach peak experiences where everything seems effortless, a unique connectedness, a human convergence of focus, energy and fulfillment. He called this state of bliss simply Flow. In my mind, that’s the true Holy Grail of Gamification, to shape an experience that meets the desired outcome in a blissful state of flow. It’s the successful convergence of Jungian We and I. A connected universe where playing leads humanity forward in a constructive mashup of competition and collaboration. Silicon Valley product advisor, #himc lecturer & mobile lifehacker. Fmr @Yahoo & @BlurbBooks product guy. Passionate about real food, travels & the outdoors.